First, thank you so very much to everyone who left a comment to help me decide where to go next with my box top. I really, really appreciate all the suggestions! As you can see with this picture, I've removed the faces (which I was really happy to do, even though I wasn't aware of it) and I've added some 'fluffies' on the buttons at the bottom. Now I'm waiting for the box proper to be done (pictured here as a black blob, but it's getting there) before I do any more to the top. I think I will dry-brush the box with purple and then play around with some gold leaf I have unearthed from my stash, which in turn will maybe lead me to put some gold fibres on the top??!! Happy halloween everyone. This is a rushed post or I would have some sort of halloween-y picture for you. We are headed out for the evening (supper, movie AND a trip to Michaels). We'd love to shell out to the little ghoulies, but we don't get that many on our street and the dogs go absolutely berserk, which in turn scares the kids - big time. It's not worth the angst so I get to go to Michaels instead. Works for me! And yes, I DO know how to use paragaphs!!! Confound Blogger anyway. Here you go Arlee...a picture of the base and leaves of the mystery plant. Yes, it has a light smell and it appears the stem (at least at the bottom) is quite woody. It's very tall and gangly too. Our elderly neighbour keeps giving us plants for both in and outside and has no clue as to what they are and nor do we, obviously! I *think* I'm finished with the box top now, unless I decide to add more to it. Unfortunately the camera doesn't quite pick up how sparkly it is in real life. Don't forget you can click on it to enlarge it. 1. I hate to use the word 'disappointment' but it seems to be what I'm feeling at this moment about the box top. I set out to work outside my comfort level and, to a degree, I've done that. However, I wanted to go a whole lot further beyond what I normally do and something seems to stop me. I keep coming back to perfectionism and downright fear that people won't like it. (This is not a plea for nice comments either - I'd much rather you give me suggestions on what I should do with it now!). Don't get me wrong - I like it now, but really wanted it to be more 'out there' and can't seem to get to that point. 2. http://denofchaos.blogspot.com is another of my favourites. There's a little knitting and the author's very, very funny outlook on life with kids and doing renovations. 3. http://doreeng.blogspot.com is another place I like to go. Doreen and I have struck up a cyber-friendship of sorts and 'found' each other through our common interest in TAST and just stitching in general. OK folks. Over to you. Any suggestions of what to do with my box top or should I leave it alone? Please comment with your opinion! "C"onscience!! That's a C word. Yep, CONSCIENCE. That's what I'm suffering from at the moment. Everybody knows there's a 'date' coming in December when things need to be completed by. I know this. It happens every single year. So why on earth am I spending my time working on a box that has absolutely nothing to do with the deadline staring me in the face? And why am I enjoying it so much, despite that pesky little voice in my head telling me I'm sure to regret this waste of time - big time. Picture of progress is included. - 'Cosmo' my 'cat' (second picture) who is the 'cause' of a lot of laughter and angst in this household. He was quite aptly named after the character of Cosmo Kramer in Seinfeld. Remember how Kramer always skidded into the room, making a dramatic entrance? Well, our Cosmo is exactly the same. He's also the cause of things going awol, amuck, and general mayhem in my workroom! - http://cuteoverload.com/ I know I've mentioned this one before too, but it's worth a look if you like animals. - http://crazyauntpurl.com/ is a knitting blog I enjoy. She has a wonderful sense of humour which is something I look for. - and 'c' is for http://www.comfortqueen.com/ if you are searching for 'self' and looking for an interesting author on the subject. Lastly, anybody happen to know what this plant is? It is extremely tall and gangly (hence the reason I've buried the flower into my lemon tree to hold it up). It reminds me of a geranium of sorts in the flower, but the leaves are long and skinny. Got any ideas Arlee? This is the base for the box top. I'm not sure where I'm going with this, but I expect it will tell me as I go along. In the meantime I have a lot of little seams to stitch down on this before I can go on. Yesterday I got my 'invitation' to join Ravelry, which I am given to understand is THE invitation of the year. I hopped on over there, and have to admit that I am disappointed. All the hype led me to expect marvels and so far I have yet to find any. Sure, there are free patterns, but there are far more on the Lion Brand website. I'm not a huge lover of forums, so can't really see much value in those - at least for me. I will continue to check it out and may have to revise my opinion, but for now, I'm not blown away. OK, world, go ahead and shoot me! 1. Books!! Of course. What else would I put at the top of my list? I have a love/hate relationship with them; I love reading them and looking at them, and hate the fact that there is never enough time to read all of them that are out there. I have a insatiable curiosity I guess! 2. An author I particularly like is David Baldacci (note the 'B' in his name). He writes really good mysteries and I have yet to read one that doesn't keep me guessing. Some of my other favourites include Mitch Albom (who wrote 'The Five People You Meet In Heaven' and 'Tuesdays With Morrie' - two books that top my all-time top 10 of books I've ever read); James Patterson; Stuart Woods; Nora Roberts; Kathy Reichs; JRR Tolkein; James Clavell; Jean Auel; and many, many more. I could go on listing names forever, but I will spare you that. 3. http://www.bookcrossing.com/ I know I've mentioned this site before but it deserves another mention. This site promotes literacy in a fun way. The premise is that once you've read a book you register it with the site and then 'release it into the wild' (ie. leave it in a public place). Inside the book you must write a tracking number, which is assigned by the site. The finder of the book (hopefully) will read it, report to the site, and then re-release it for someone else to enjoy. Some books have been totally around the world, which I find amazing. What a fun way to encourage reading - and it's free too! 4. http://sharonb.wordpress.com/ I know that I keep telling you about this blog, but it's one you really need to visit if you are the least bit interested in the world of needlearts. Sharon B is one of the most knowledgeable people about the subject and very generously shares what she knows. 5. http://beadjournalproject.blogspot.com/ Again, I know I've mentioned this one before too. If you are interested in beading, check it out for a year-long project involving beaded journaling. - pretty obviously I should start with the A-Z book series, which I have to admit I love. 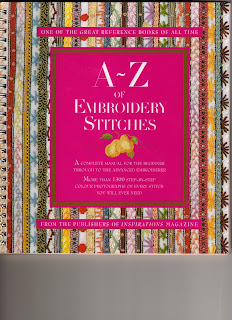 So far I own the Embroidery one I've pictured here, along with 'A-Z of Ribbon Embroidery', 'A-Z of Embroidered Flowers', and 'A-Z of Bullions' - any and all of which I would recommend highly. They each have very good instructions and lots and lots of coloured pictures, which we all like! - 'A' is also for one of my favourite blogs: http://arleebarr.squarespace.com/designjournal Albedo Designs (ie Arlee) is a great artist and my biggest inspiration to move on toward being an artist as opposed to a 'crafter'. Actually, yesterday she wrote a very insightful post about that very topic. - 'A' is for another of my favourites: http://alliesinstitches.blogspot.com Allison Aller is another of my inspirations. She does the most wonderful things with flowers and embroidery that I've ever seen. -'A' is also for another site: http://artsymama.blogspot.com This blog (whose name escapes me at the moment...did you know "a" is also for Alzheimers??) makes you really think about the 'junque' you find at flea markets and making art out of those finds. 1. I will be starting a 'series' of posts on my blog concerning the 'A-Z of Me' for those days when I have nothing in particular of interest to natter on about. The idea came to me from the following blog site: http://belladia.typepad.com/ Be sure to check her out, because she makes some pretty cool things! She has very nicely given me permission to use her idea on my blog too. Thank you Cassi! 3. I can't remember if I mentioned this site before, however... http://philinthecircle.com/art.html His art is out of this world! 6. Went to a new dentist today. Never had a more thorough cleaning of my teeth in my life..and they're still not done! I couldn't believe it. Of course now that we have to pay for it (and not get it 'free' through a medical plan) might be making a difference. Certainly has eaten a rather largish hole in our meagre coffers and more to come, but at least not until after Christmas. I guess I should be happy about that. The first picture shows the box once I got the innards pretty much removed. The brown blobs you see are from the glue they used and, believe me, it's pretty gross. The next step was for DH to take it apart for me to make it easier to work on. The second picture shows the addition of a coat of gesso, which I've come to a screeching halt with because I've run out. The box is very 'thirsty' and is gobbling it up, big time. Now I wonder - where do I get some more in this town?! After all, I'm on a creative spurt here and don't want to stop! I think these are actually the last roses of summer 2007. It's hard to believe they are actually still blooming so bravely. I guess they chose now to bloom because they are surrounded by beautiful icelandic poppies most of the summer and can't reach above the crowd. Aren't they pretty? And, the other picture is a 'before' of a project I'm planning to work on. This banged up old jewellry box was a 'found' item in my bil's house after he died. I assume it must have originally belonged to my MIL, but not sure. At any rate, I'm overhauling it, hopefully making into something a bit funky and useful for storing stuff. Don't know what I'm doing with it yet, but hopefully inspiration will strike when I start tearing it apart. I'm sorry, I know Blogger doesn't post the pictures the way I want them to, so these are probably out of order! Week 42??! That means there are only ten weeks left in 2007. Wow! Just where did it go?? Today it is dull and rainy, which I suppose is good for the new grass seed DH planted yesterday. As for me, the combination of damp and the leaves falling isn't good for my allergies, so its a good day to play around with knitting needles and hide in my basement studio where I can't see out! For lack of something better to blog about today, here's another book review. Sorry about the bad scan! I shall quote some of the info on the back cover (since it says it better than I ever could): 'Revitalize classic embroidery stitches for a contemporary look simply by adding beads to your needlework'. 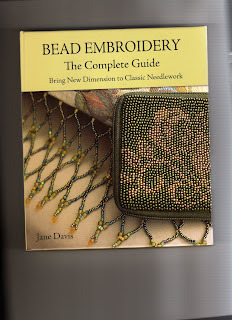 The book includes basics on beading, threads, tools, etc. There are 215 embroidery stitches, translated into beads and there's 20 projects too. 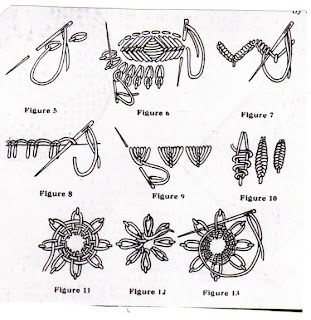 The instructions are quite clear and there are some great ideas of ways to use beads in embroidery. 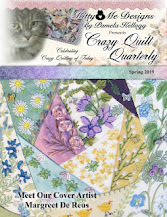 Crazy quilters would like this book, for sure. Working on Christmas presents doesn't lead to a lot of pictures for blogs, especially when people are readers! Sorry 'bout that. Will try to improve!. 1. SharonB of http://sharonbwordpress.com has proposed a new challenge for 2008 to replace the current TAST (Take A Stitch Tuesday) whereby we all attempt to reduce our stashes and work on our stack of UFO's. I think it's a great idea (long-time readers of this blog will know I've been reducing stash anyway). I love the thought of being accountable to someone, whether it be someone I know personally or a cyber community. Being accountable to myself just doesn't happen because it's too easy to just say I'll do it later and go onto something else that is currently of interest. The proverbial start-I-tis syndrome which leads to a lot of WIP's or UFO's languishing in piles and boxes, leading to being overwhelmed AND huge feelings of guilt. Sharon's original proposal involved actually weighing our stash and UFO's at the beginning of the year and again at the end. Nope, not me! They don't make scales big enough! I think the majority seems to feel the same way, so I don't think there's going to be a weigh-in. Either way, it will be interesting to see what happens with this. Oddly enough, on the same subject - Knitting Daily has been talking about the very same thing...UFO's and why we have them. When I returned to knitting I swore I would NEVER (hah) have any more than one project at a time on the needles. Well then. Ahem. I lied. Yep, I admit it - I lied. The number has risen to five and is threatening to keep increasing. What is it with knitting anyway? And why is it that we (I) have to have a different knitting bag for each project? It's an illness I know it is and it appears as though it's infecting more and more people all the time! The final two on the list aren't strictly about knitting, but have some. Mostly they are good for a laugh, which we all need. 3. Another interesting site I have stumbled upon is http://www.comfortqueen.com which in turn has led to me going on a reading binge of her (Jennifer Louden) books. Currently I'm reading 'The Woman's Retreat Book - A Guide to Restoring, Rediscovering, and Reawakening Your True Self in a moment, an hour, a day or a weekend'. I also have her 'The Woman's Comfort Book - a Self-Nurturing Guide for Restoring Balance in Your Life' waiting to read next. I can't say as I will be following a lot of her suggestions, but certainly am finding there is a lot to think about. As women we are in serious need sometimes of learning to look after ourselves, not only physically, but mentally as well. 4. Today I dyed. Yep. It's 'that' time of year for the proverbial flip-the-mattress-wash-the-entire-bedding process. Who knew that a green wool blanket would turn a flannel sheet the most interesting putrid shade of P-green in the washer? oops. 5. Has anyone ever figured out a use for dust bunnies? It's one of those questions I would like to have answered. If there's a factory somewhere in the world that makes something with them, would you kindly let me know? I have a big supply, just waiting for a good home. All postage paid. It's hard to believe that we're into week 41 already of this challenge. It just seems like yesterday it started! I'm going to be really sorry to see it end. Week 40 is another stitch new to me and is called Linked Double Chain (in red in the picture). I liked this stitch very much and will certainly use it in the future. Then we come to Week 41. Oops. It is supposed to be the Lace Border Stitch, and quite obviously I'm doing something wrong! However, to be honest, I kind of like what I ended up with and can see it with a pretty flower bead in the open spots. I guess I'm destined to do some more work with this one! This is another of the bras that was included in the Bras For A Cause fundraiser. I thought this one was well done and full of significance. - wonder why blogger has a 'thing' about sometimes including spaces for paragraphs and sometimes not. I really do use them you know! - it's a good thing that blogs don't get laryngitis like I seem to have at the moment. The darn tree leaves are doing 'something' (in this case, falling) and whenever they do, my allergies kick in. This time I'm losing my voice, which tickles the other housemembers tremendously. They have no sympathy. - Cleaned windows today. Yep. You really needed to know that. - check out http://nostalgicneedleart.blogspot.com for some great instructions for making flowers from ribbon and for dyeing ribbons too. - http://sallycraft.blogspot.com has a couple of interesting tutorials, both about making beads using recycled plastic bags, knitting needles, and a heat gun. Pretty cool. There, that ought to keep you busy for a little while. Hopefully you find something to interest you! Bet that title caught your attention! The first picture today is some of the new/old beaded purses I have hanging in my workroom. The black one is old, but I'm not too sure about the age of the white one. The blueish-purple is one that I knitted with beads a couple of years ago. 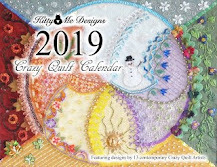 The round beige one was made for me by one of the elderly ladies in our quilt guild to go along with my lovely porcelain doll, which was recently beheaded by the cat. Yep, Cosmo worked his magic and isn't smart enough to run from the scene of the crime. I was upset but it's only a doll, even though I did take lessons on how to make it! There's no longer a doll-making studio in the area, so there's no hope of replacing her. As for the bras, the second picture is for you Arlee. Thought you might like to see how someone else worked with copper sheeting! No, I didn't make it...it was one of the bras that were donated for the Bras For A Cause breast cancer fundraiser. I thought it was quite unique. Today I've spent my time 'making fabric' out of odds & ends to use for the PSI swap I'm in. I pretty much used the directions for fabric charms which is a free tutorial on the Fibre & Stitch site ( www.fibreandstitch.com) which was written by Sue Bleiweiss. Of course I didn't have the exact requirements but managed to find something that worked. The second picture shows the fabric cut into PSI's and finished around the outside. Now I just have to put something on the back and they're good to go! I'm likin' these. I just finished putting these together...eleven sets of wine glass coasters ready for including with my Christmas presents (and in some of the stockings). They are simple-cinchy to make, which is what I like at this time of year. I put a wine glass in one so hopefully you can see. These coasters stay with the glass wherever the person goes, which is a bonus for those who like to protect their furniture against people who forget to use coasters! Yep, I'm wearing my Santa hat today and getting a few projects done. Don't get excited though because I have a long way to go! The pictures show the tote bag/padfolio combo I've made for several people (this one is for a friend who doesn't read my blog so it's safe to show). The tote is a pretty basic pattern and is using up some of my recycled denim stash. The padfolio pattern originally came from Sue Bleiweiss at www.suebleiweiss.com . I've tweaked it a bit (with her permission). Just hope she approves of what I've done! Thanks Sue. As promised, here's the picture of the lutrador Arlee painted (and burned) for me. I had been curious to know exactly what lutrador is, so she was nice enough to give me some. She said it's also known as 'synthetic rice paper' in flower shops, so I'll have to do some field work to see if I can locate it locally. The other picture is of the lonely birdhouse gourd we managed to grow of any size in our garden. There are a couple of small ones, but I don't expect them to grow any more. This was an experiment, just to see what would happen. I'm waiting for the vines to die and then I'll put this one in a pantyhose bag and hang it in a cool dry place (the cold cellar I guess) and see if it dries. I read somewhere that it could take up to six months! Goodies in the mail and 400!! Now who would have thought I would stick with this long enough to reach 400 posts?! Who knew I had that much to talk about? Today's picture (which you will need to click on to enlarge) is of some of the goodies my friend Arlee ( http://arleebarr.squarespace.com/designjournal sent me. We traded for the atc's and I'm pretty darn sure I got the best end of the deal! I love her work. The lace is some she hand dyed (painted). So pretty and I'm sorry the colours aren't showing well in this picture. The gorgeous green piece is an unfinished (her words, not mine!!) pin, which I am supposed to complete. I'm thinking maybe a row of beaded picots around the outside will definitely be enough. She also sent me a great piece of lutrador which she had 'altered' which I neglected to include in the picture. I'll save that to show in post # 401. I found two things to show you today. The first is a few embroidery stitches I found in one of the 'Needlecraft Magazines' I've been given (dated February 1928). The magazine says it's No. 5 of a series, so I'm hoping I will be able to find some more once I get through them all. I'm particularly interested in the bottom stitch combination, which is one I have never seen. Can't wait to try it on something! The other two pictures are of a really pretty needlecase my friend Marie made for me a couple of years ago. It is absolutely perfect to use when I'm out and about because it has a nice long ribbon which allows me to wear it as a necklace. How cool is that?